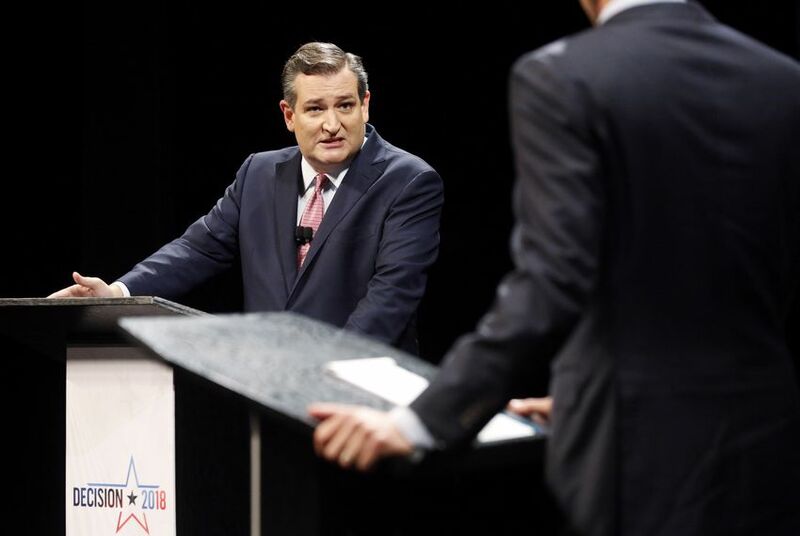 At the first of three U.S. Senate campaign debates, Ted Cruz and Beto O'Rourke lobbed attack after attack. Here's the history behind some of their claims. At their first debate in Texas’ 2018 U.S. Senate general election campaign, U.S. Rep. Beto O’Rourke, D-El Paso, and incumbent Sen. Ted Cruz, a Republican, traded blows Friday over a range of issues that included immigration and criminal justice. The face-off was often heated, with candidates tossing attacks back and forth. Did Beto O’Rourke refer to law enforcement as “modern-day Jim Crow”? “Just this week, Congressman O’Rourke described law enforcement — described police officers — as modern-day Jim Crow,” Cruz said Friday, referring to a post-Reconstruction system of legally sanctioned racial segregation..
Cruz seems to be referring to comments O’Rourke made this week at a town hall at Prairie View A&M University, a historically black college in Southeast Texas. O’Rourke used the phrase “new Jim Crow” to refer broadly to an unjust criminal justice system that targets African-Americans. "That system of suspecting somebody — solely based on the color of their skin. Searching that person — solely based on the color of their skin. Stopping that person — solely based on the color of their skin. Shooting that person — solely based on the color of their skin. Throwing the book at that person and letting them rot behind bars — solely based on the color of their skin. It is why some have called this — I think it is an apt description — the new Jim Crow," O’Rourke said. Cruz says he supports health insurance protections for individuals with pre-existing conditions. Texas’ junior senator said Friday that “everyone agrees we’re going to protect pre-existing conditions” in the health care system — a group estimated to include about 130 million Americans. But Cruz has also signaled support for a Texas-led lawsuit that aims to kill the entirety of the Affordable Care Act — including the pre-existing conditions protections, which are among its most popular provisions. Cruz, a longtime Obamacare critic who has often campaigned on the issue, has said Texas’ legal argument “has considerable force” and that if the courts side with Texas, it would be a “win for health care consumers across the country.” But his comments Friday and in the past suggest he seems prepared to support a legislative fix to protect individuals with pre-existing conditions should the lawsuit succeed in striking them down. Does O’Rourke support legalizing “all narcotics”? Cruz last night attacked O’Rourke, a former El Paso City Council member, for introducing a resolution in the council “calling for a national debate on legalizing all narcotics.” Cruz, who lost his sister to drug addiction, said it would be “a profound mistake” to legalize all narcotics amid the country’s opioid crisis. O’Rourke countered, as he has in the past, that he was merely using the resolution to catalyze discussion on the subject. “To be clear, I don’t want to legalize heroin and cocaine and fentanyl,” O’Rourke said Friday. And he used Cruz’s comment to pivot to one of his go-to campaign promises: a call to decriminalize marijuana. The El Paso congressman has acknowledged his 1998 drunken driving arrest, describing it as “a serious mistake for which there is no excuse.” His car hit a truck driving in the same direction on Interstate 10 and crossed a median onto the other side of the interstate. But O’Rourke denied Friday that he attempted to flee the scene. A witness told police at the time that O’Rourke had “attempted to leave the accident but was stopped,” according to a police report of the incident published by the Houston Chronicle last month. O’Rourke recorded a 0.136 and 0.134 on police breathalyzers, exceeding the limit of 0.10. Asked about the incident at Friday’s debate, O’Rourke acknowledged the accident but denied that he had tried to flee. “I did not try to leave the scene of the accident, though driving drunk, which I did, is a terrible mistake for which there is no excuse,” O’Rourke said. How often was Cruz absent from the Senate while running for president? O’Rourke claimed last night that Cruz missed “one-quarter” of Senate votes in 2015 and “half” in 2016. That’s true, according to data compiled by GovTrack, which indicates Cruz missed 24 percent of eligible votes in 2015 and 50 percent in 2016. Cruz countered that he has always been on the ground in Texas when constituents needed him, including last year during Hurricane Harvey.